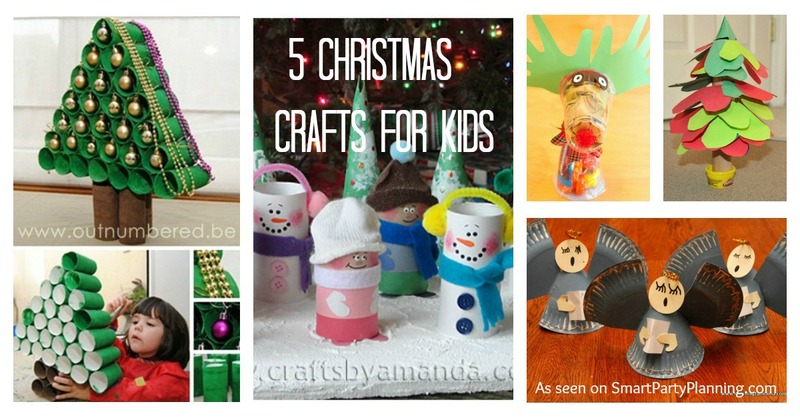 Need some easy and fun Christmas crafts for kids to make? These ideas are great for children who are looking for simple and easy crafts which they could also turn into Christmas gifts. Kids can be creative with these craft, and they are great for the toddlers and preschoolers to make too! Kids love to craft. It seems as soon as my daughter has jumped out of bed, she is asking to make something as she stands there armed with a glue stick and a glitter pot in hand. She doesn’t even know what she wants to make most of the time. She simply wants to craft! Unless you are super creative and can think of a craft idea off the top of the head whilst your child is constantly saying “Pleeaassseee Mommy”, then some guidance would be greatly appreciated. Simple is the name of the game here though. The easier it is to make, the higher the chance that your child will actually finish the craft themselves and not you! These crafts also make awesome Christmas activities for preschoolers and they can even turn them into little gifts. So grab some glue, toilet rolls, and paint and let’s get crafting!! There is something about reindeer’s that makes absolutely adorable decorations. Maybe it’s the cheeky looks that you can give them. This reindeer cup craft by Be a Fun Mum is so much fun and definitely something the kids would love to create. I love the personal touch of using hands as the antlers….I mean come on….all parents are going to love this. What is more adorable than seeing the outline of your cherub’s hands! The full tutorial is within the post and it is incredibly easy to follow. I did say earlier to go and grab the toilet rolls and I wasn’t joking. Seriously though, you can’t have many Christmas crafts for kids without making use of toilet rolls can you! The toilet roll Christmas tree by Outnumbered by Kids is so clever. A Christmas tree made out of toilet rolls…pretty awesome right?! This would also keep the kids occupied for hours with the making and then decorating of the tree with Christmas baubles. When I said to get the toilet rolls ready I really meant it! Next up on our list of Christmas crafts for kids are these super cute cardboard snowmen characters by Crafts By Amanda. I can see making these would be quite addictive though as each character would add a new dimension to the group. You can’t help but smile when looking at this bunch. Another fab item to use in kids crafts are paper plates. As soon as I saw these cardboard angels by Meaningful Mamma I knew they were a must to feature. Making these adorable angels includes paint, glue and glitter….arn’t they the three things that kids absolutely love? The result are these beautiful singing angels which can sit with pride of place! This Christmas tree of hearts by Blog Me Mom is super adorable. I love the simplicity of the tutorial, how easy it is for the kids to make, but the end result still looks awesome. I can see a lot of kids being very happy when they have finished making this one. So the next time that your child is standing there armed with a glue stick and a glitter pot, just remember these easy Christmas crafts ideas. Enjoy your crafting with the kids!! What a great round up! Thanks for including my plastic cup reindeer. Your welcome Kelly. What an absolutely gorgeous idea it is…the kids would LOVE to make this one! !